« Breaking: Saudi Gov Lets Women Ride! 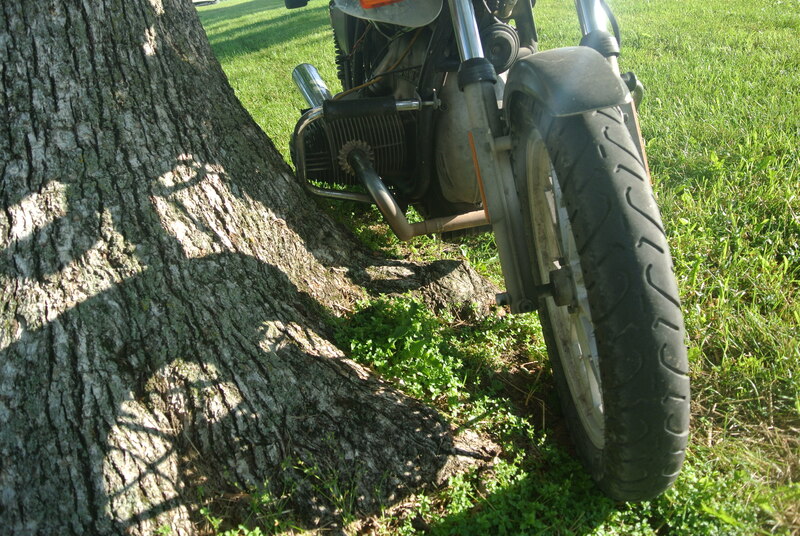 Old airhead parked against an old tree, makin’ the best of a bad scene. Sorta like the drunken rider that in search of bladder relief, completely ignored the porta potty facilities not a hundred feet away and staggered over to a tree nearly a hundred yards away. Having largely deposited the contents of his bladder on himself, he assumed an uncomfortable sleeping position at the foot of the unfortunate tree whilst I made periodic checks on his health. After an hour or so and he hadn’t woke up and returned to camp, we woke him and half carried him to his tent. Neatly laid him out on his mattress in his tent, and he promptly rolled over and slept on the grass. 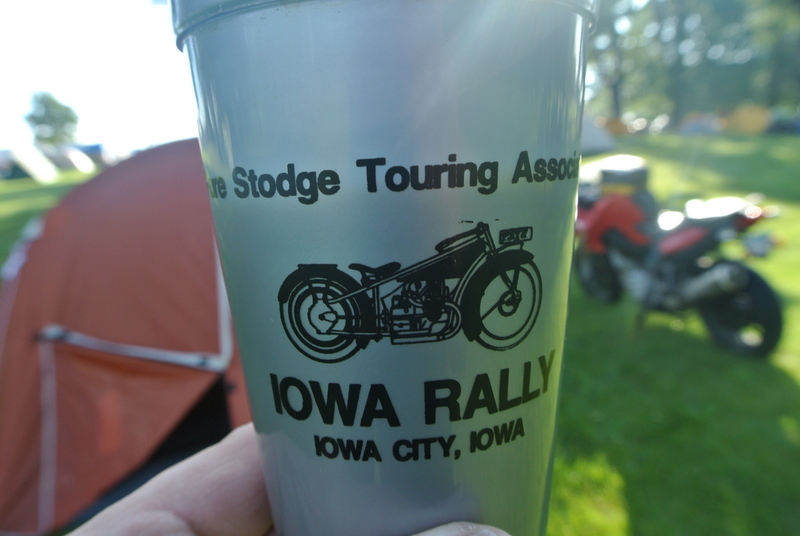 So it is with the Iowa BMW Rally, the legendary offspring of the late Kieth Dempster and the Pure Stodge Touring Association. That legend was made by keg laden golf carts that drove over and refilled your mug so you wouldn’t have to get up and walk over to the beer trailer to get a refill, bands that played ’til 2am, and a big and tasty feed every night. Back in the glory days a couple decades back all this drunken debauchery attracted an attendance of over a thousand from all over the country… These days attendance is a couple hundred, the keg totin’ golf carts are gone, and there’s no waiting lines at the beer trailers. The food was passable ‘cept for friday morn’s frozen biscuits and gravy, but at least the local Lion’s club hasn’t got the word of BMW rider’s reputed affluence and their prices were pretty reasonable. Now there’s been lot of talk lately about how local rally attendance has dropped, and don’t help any that BMWMOA, the national club, is competing with the local clubs with a handful of luxury priced events around the country. But I suspect there’s some demographics at work here… Back in the old days most everyone partied hardy, I being one of the few exceptions who after being kept up ’til 3 am and then woken by the sun at 5 am to face a drowsy ride home didn’t return for years. Back in those legendary decades of heavy drinkin’ there were enough ridin’ drunks to overflow (including the toilets) the Iowa and similar rallies. Digging through the demographic data, barely half of american adults drink every week these days. The heavy and binge drinkers that the Iowa Rally catered to are a dying (in some case literally) demographic, dropping into single digits. When your core demographic is dwindling, and when they get drunk and chase the mainstream demographic away, your rally has a problem. Couple decades ago there were plenty of drunks to keep the Iowa Rally full… Today, not so much. And therein may be the key to declining rally attendance. So while young riders are looking for fancy coffees and eats, many rallies are offering barely passable food, basic CNS stimulating and unstimulating coffee, and maybe some hot water if you’d like powdered cocoa or tea. Then the remaining drunks keep the non and moderating drinkers up all night, and chase them off. And heck, I’m amazed anybody can get insurance to serve unlimited booze anymore… My union hall was built with a bar off the meeting room so we could serve beer after meetings, but since the insurance company jacked the rates if we served liquor in the 1980s, that bar has served only soft drinks. And weren’t rallies founded back in the 70s in response to tougher DUI enforcement, to allow drunken riders a place to camp and sleep of their elevated BACs? Yup, and the annual BMWMOA international rally may have a more balanced approach to the problem- Sell booze, but at prices competitive with the local bars so riders have no reason to ride to said bars and back drunk. So Iowa Rally, maybe it’s time to loose the beer trailer and do something revolutionairy… SELL beer! Yup, bring in some more revenue, then plow that revenue back into better coffee and soft drinks and food. Then enjoy a multiplier effect, as the word gets out that your rally is no longer a mass binge and non binge drinkers swell your attendance. Then throw out anybody keepin’ folks awake after midnight, like any civilized society would, and it might take less than half a decade for me to come back. On a positive note, the forecast for rain was way off and I rode through but five miles of rain on the way home!